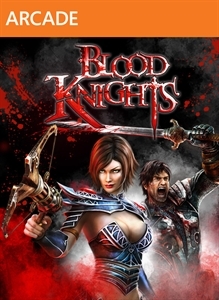 XBLA Friday is here with Blood Knights! Blood Knights has you controlling a vampire hunter in this new hack and slash title with some RPG elements mixed in. From the trailer below, it reminds me a bit of Diablo and Champions of Norrath, as well as the Zombie Apocalypse title that was released a few years back. I always these type of games. The game is also playable in co-op, so give it a download and get a friend to play with! Blood Knights will cost $14.99 and requires 1.02 GB of space. "Humans have possessed the seal of blood for thousands of years, which has prevented the demons from setting foot on the Earth. It contains the frozen blood of the most powerful, immortal vampire, Kain, and on no account must it fall into the hands of the vampires. After the guardian of the seal dies, the vampires try to acquire the it. They’d better watch out though, because the humans will be deploying their best vampire hunters, like Jeremy, who are determined to stop them."